Infrared asked Dataflow Events to prepare a Hospitality ticket management portal for their client Visa who host a suite at the O2 areana. The suite has 20 seats and there are over 150 events throughout the year. The platform needed to accommodate the application and approval of Visa employees to request tickets for all events. Having been approved, users should then be able to see all up-coming events, see additional information pages, request tickets and see the status of their different applications. Administrators, approve and manage new users, approve ticket applications and access reports on ticket take up. The platform delivered on all of the requirements. The VISA site had a simple website with VISA branding. Administrators are able to create all events, as well as sort and process user requests at their own discretion. They were able to adjust the number of tickets awarded to each applicant and reject or accept the requests. This resulted in emails being sent to both parties to inform them on the progress of applications. Reports for the administrators can also be filtered and exported to Excel as required. 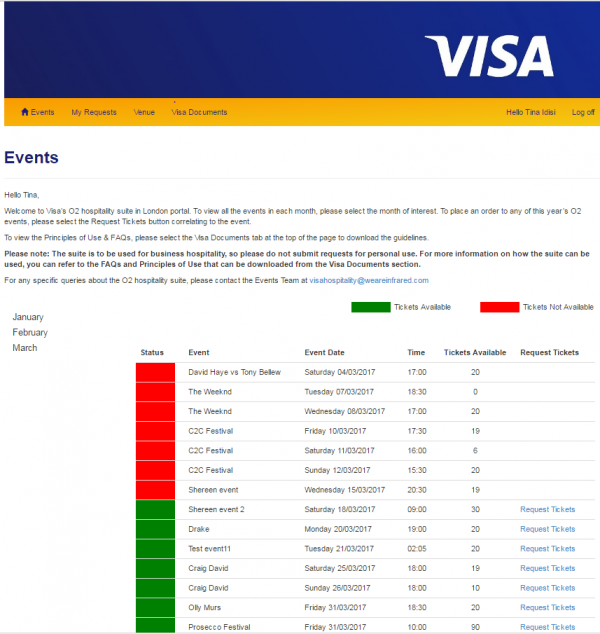 Visa users can see an accordion style calendar presentation of the events throughout the year, when a user signs into the website they instantly see the current month. There was a simple request tickets registration pages for the users to attend the events. Users can also download Visa related PDF’s for guidance and additional process instructions. It is currently an ongoing event project with the website being a streamlined and efficient process. The user and admin portals worked well together.